Then how are we to grow in faith, knowledge, and love of Jesus and of his Church? How are churchgoers and paid-up members of the clergy meant to carrying on the process of becoming disciples? We do this in two complementary ways, through prayer and constant learning. The first way is fairly straightforward as we are doing it here now. Through both corporate worship and daily prayer we practice the virtue, the good habit, of religion which leads us deeper and deeper into the Heart of Jesus Christ. The second way, constant learning, requires our regular commitment in engaging with the Bible, the principles of the Christian faith, and the tradition of the Church. This type of learning, perhaps “holy learning”, is called formally catechesis. This odd-sounding word, catechesis, comes for the Greek and it means “instructions by word of mouth” or more simply “instructions”. Every time the Church has faced great periods of growth, change, and challenge, these times were also accompanied by great efforts in catechesis. So, catechesis simply means handing on to others the faith so that every Christian might both grow in confidence about what they believe, and increase their knowledge of Jesus, coming to love him more and more. However, until a few decades ago catechesis meant learning a number of dry affirmations about God and his Church, something akin to learning a religious version of the times tables – in fact more seasoned Anglicans may remember a collection of set instructions called the Catechism. But times have changed, and as a Christians we need more engaging ways to explain and explore our faith; therefore, catechesis is a word the Church of England has been trying to rediscover and reinterpret for use in our days. With your pew sheet, you should have been given a leaflet titled Pilgrim. 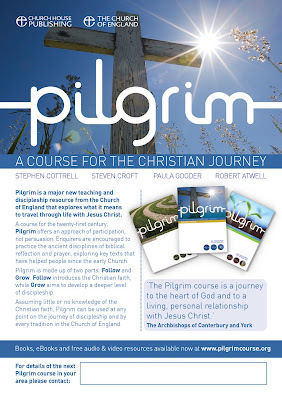 Pilgrim is a new way of doing catechesis, a new way of exploring the faith and learning about Jesus. It is my hope that we will use the first part of Pilgrim as a Lent course to which all will be warmly invited to come; regular churchgoers, newcomers, and anyone who simply wants to find out more about Christianity. I was asked recently by an evangelical brother, ‘How many Christians do you think there are in your congregation?’ To which my reply was that the Church teaches that all baptised are Christians and that I wasn’t in the position to judge who was “in” and who was “out”, as it were. All of us are Christians and all of us (and I do mean all) need to work on it. As I have demonstrated to you from the gospels, being a disciple of Jesus is not a matter of once-for-all decision but a lifetime pursuit, so it is my hope that following Pilgrim we may grow together in faith, knowledge, and love of Jesus more and more each day.